***3/5 stars – liked it. An orphaned pick-pocket makes a comeback: It’s a must-read kick off to the Covent Garden Cubs Series. When Susanna finally makes a break away from her mother’s eagle eye, she runs into a man who’s lived his life on the edge. As Susanna enjoys an adventure of a lifetime, she must make decisions for the rest of her life. 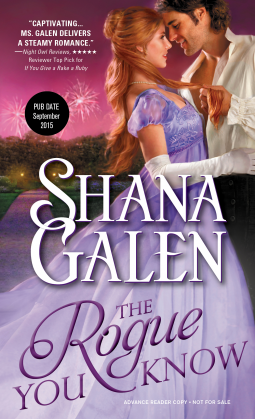 In the tone and pace I’ve come to love from Shana Galen, The Rogue You Know is a fun adventure, with unique twists and charming characters. If you’ve loved previous Galen novels, you’ll love Books 2 of the Covent Garden Cubs.